The Toronto Tea Festival is Coming! It’s the most wonderful time of the year! Next weekend marks the 7th annual Toronto Tea Festival. It’s always a fantastic day out, with great speakers, demonstrations and vendors. And of course, tea tastings. Even though I just inventoried my tea, which now has grown past 200 varieties, you bet I’ll be there to discover even more. So whether you need to stock up, find something new, or just learn about tea – there’s something for everyone. 3. I whisk up some matcha. After combining them all, and adding a bit of agave to cut the bitterness, a stir and it’s good to go! It looks like Starbucks Singapore has offered a cold version of this for a while. I’ll save the iced recipe for a warmer day. I’m not sure why it took me so long to visit Bampot Bohemian House of Tea and Board Games in Toronto, but I finally discovered this wonderful place last week. As the name suggests, this restaurant is a tea shop meets board game cafe, and it’s really awesome. There is even art everywhere, up for sale. Located at Bathurst and Harbord, Bampot basically has the feel of a giant living room in the middle of the city, and what better place to relax with a cup of tea. This chill vibe is perfect for any winter day in Toronto. Oh, and they have poutine soup. POUTINE SOUP. (Yes, it’s damn good). I will be back, because, like… tea… poutine soup…. This post is almost a year late… but better late than never? Last year I visited Holland and Belgium, and obviously some tea shops… I’m going to share a few of my favourites. One of my favourite cities that I visited while in the Netherlands was Haarlem, where I discovered probably the best tea shop I have ever been to. The shop is called The Art of … Tea, Herbs and Spices. I was in heaven. It was hard to choose what to buy, but one of my favourites I picked up is Het Palet van Rembrandt – a green rooibos. Look at all that tea! HEAVEN! The Tea Bar was also a fun find. I learned this shop uses some of the same tea suppliers as David’s Tea… just a little further away! Another favourite was Four Leaves. This was a great spot for a rest after a long bike ride in Amsterdam. I love the Carpe Diem rooibos blend I picked up there. I didn’t stop there though….Simon Lévelt was a great chain I found. I’m a huge fan of the Honeybush Mango Lemon. Wait… there’s more. ‘t Zonnetje was another great one in Amsterdam. This tea shop is in a building from the 17th century and has some great charm. The guy in the shop was great to talk to. Very cool! Oh but there’s still more… judging me yet? In the Hague I discovered Wijs & Zonen, yet another charming tea shop. My favourite from there was a green tea called Hemels. In Brussels I visited Palais Des Thes, a favourite of mine after discovering it in Paris a few years back. 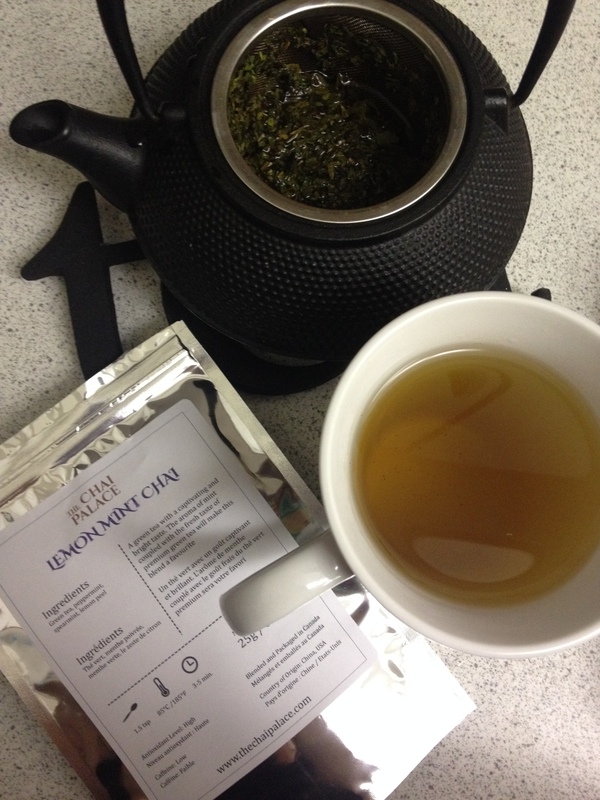 Thé des Alizés is awesome – a peach flavoured green tea. I also stumbled across Betjeman & Barton another Paris company. I do believe I visited the location in the Hague, but there are locations worldwide, including Belgium as well. Until then I better make some room for new teas! I made pickles with tea! In January, I visted the annual Toronto Tea Festival. I enjoyed some talks on tea, visiting tea booths and of course trying a lot of tea! Now, you’re probably wondering what pickles have to do with the Tea Festival! At the festival, I picked up a cooking with tea recipe book called Hot Tea: Cooking with Camellia Sinensis by Suzanne Catty. One of the first recipes that caught my eye was for pickles. Confused at first, I learned tea can keep pickles crunchy! How? Those tannins found in tea (which are also found in wine… hmmm… wine pickles….). Tannins are naturally occurring polyphenols. They were quite delicious. Mine turned out a bit sweeter than expected, so I may cut back on the sugar the next time I make them and I also plan to experiment with a garlic version. 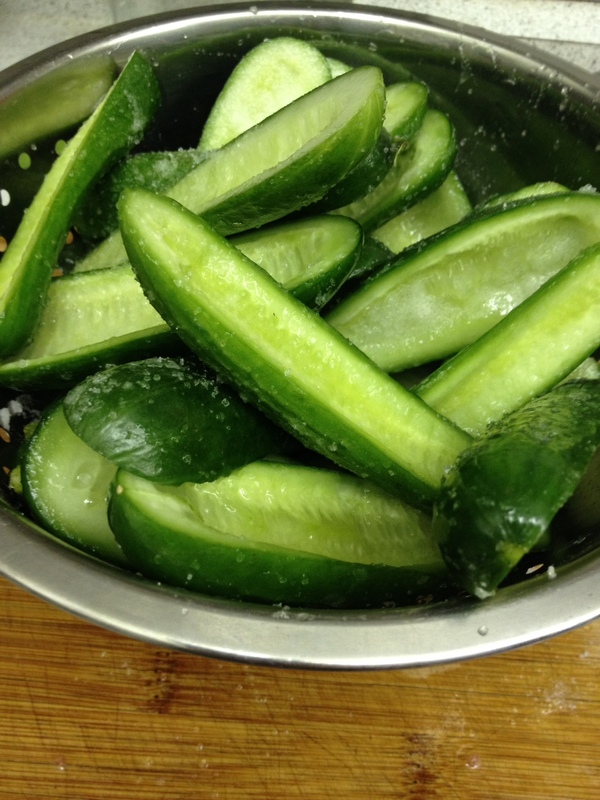 I also used baby cucumbers sliced in half as a substitute, so mine look a bit different than they would if I used the English cucumbers the recipe calls for. Anyways, the recipe is as follows and is taken directly from page 20 of the book (Catty, 2015). Hope you’ll give the recipe a try and let me know what you think. Happy pickling! One of my new favourite tea obsessions is kombucha – and I feel like I’m one of the last to the party. After discovering kombucha, and learning how much it is to buy a bottle (3 – 6 dollars), I decided to brew my own “buch”. There are tons of sites on how to brew kombucha, so I won’t get into too much detail on how to brew kombucha here. To find out more about brewing visit Cultures for Health. In a nutshell, you brew unflavoured tea (oolong, black and green work great) in sugar water. After the mixture cools down, you add the SCOBY (symbiotic culture of bacteria and yeast) and you’re good to go! 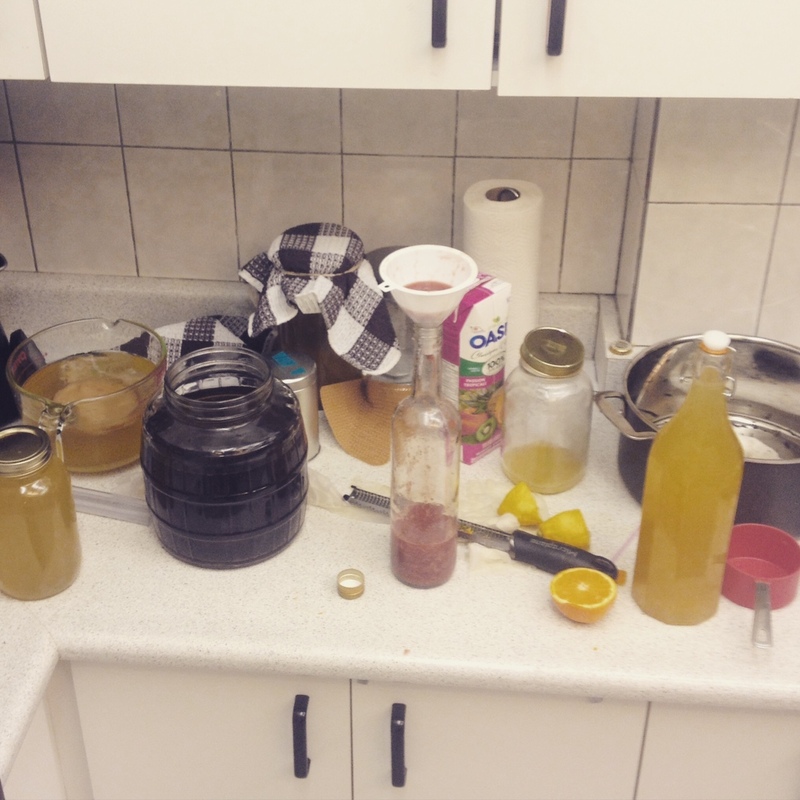 After 7 – 30 days the brew is ready and you have kombucha. If you are going to attempt a brew, make sure you follow the ingredient ratios very closely as listed on the different sites. 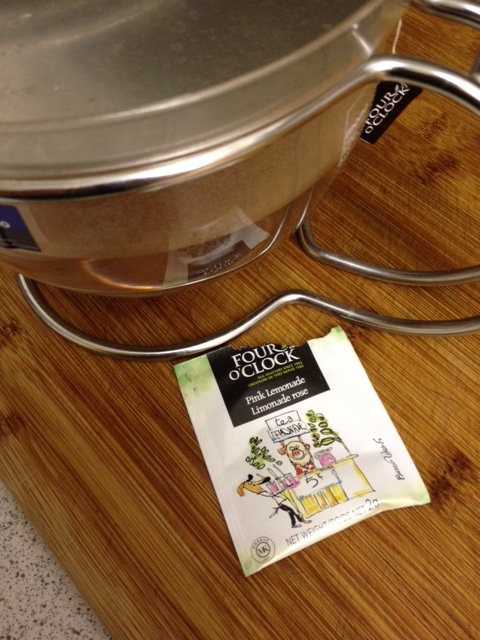 After brewing comes the fun part – flavouring the kombucha. My favourite, quick way to do this is to create a 20 percent juice, 80 percent kombucha mix. Grape juice is my favourite. Bottling it in a Grolsh style bottle and leaving it on the counter for a few days makes a wonderful, fizzy flavour of kombucha. Apple juice mixed with cinnamon makes a delicious applie pie flavour. Of course, plain kombucha is also great. And for a subtle flavour, some freshly squeezed lemon and orange goes a long way. So why kombucha anyways? It is kind of weird right – drinking a tea that fermented via bacteria and yeast. Mainly, I’m doing it for the taste. It’s a wonderful alternative to other types of beverages. 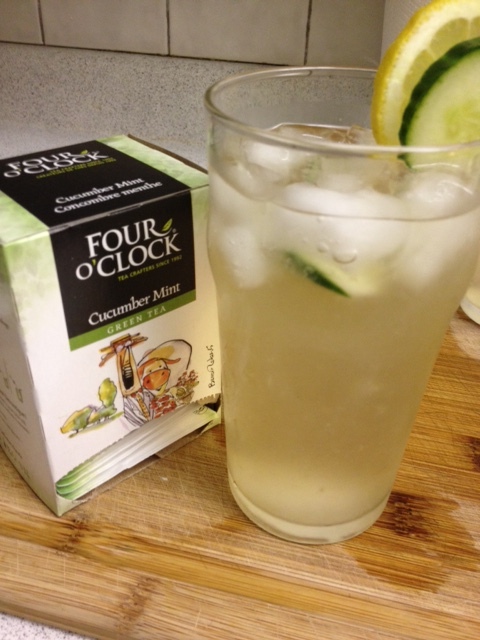 It’s a great, quick drink to have in the morning for a fast jolt of caffeine. It’s been enjoyed by many for years, and has been dubbed the “elixir of life.” Some call it almost a cure all – for all types of ailments, such as pain, digestion and hangovers. I can’t say I have noticed any changes since I have began enjoying kombucha, but there is tea in it, so there is no denying there are benefits within the drink. If you haven’t tried kombucha yet – give it a shot. It’s not too difficult to find these days, and almost all health food stores will most likely have some bottled kombucha in a variety of flavours. My first big batch of kombucha brewing – I have since switched to a 1 gallon jar with a nozzle for a continuous brew system. My poor neglected blog has been looking for some inspiration, and I finally have some! 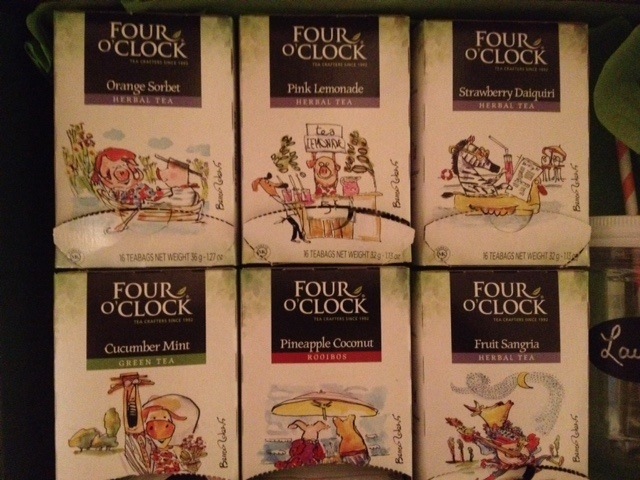 I received some wonderful Four O’Clock tea samples from Trans-Herbe, just in time for summer. The summer 2015 flavours include: Rooibos Pineapple Coconut, Cucumber Mint Green Tea, Fruit Sangria Herbal Tea, Orange Sorbet Herbal Tea, Strawberry Daiquiri Herbal Tea and Pink Lemonade Herbal Tea. 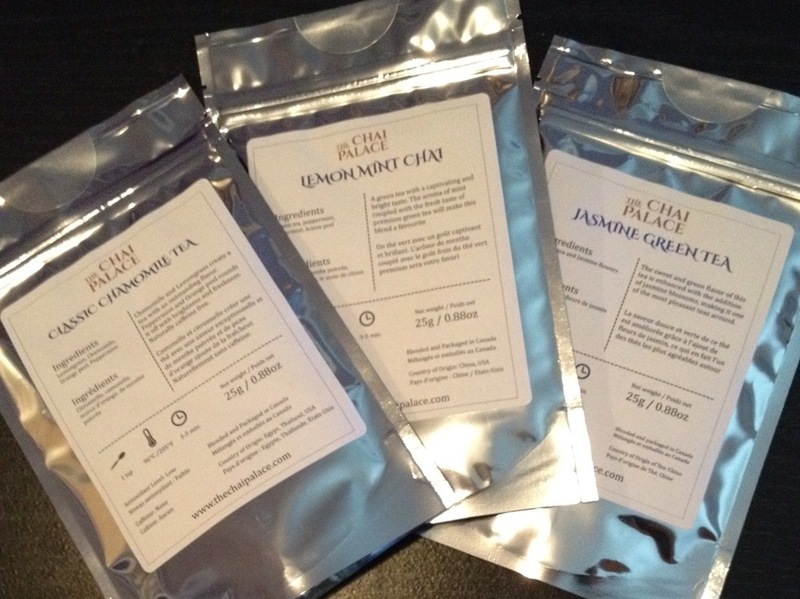 While I usually talk about loose leaf teas, these tea bags were quite great. The first thing that caught my eye was the amazing artwork on the bag – which was created by Montreal artist Bruce Roberts. These teas are great cold, hot and of course, in cocktails. Trans-Herbe has provided me with some wonderful cocktail recipes as well that are inspired by mixologists Marc-André Fillion and Lawrence Picard, check out the recipes here. So far I have experimented with the Green Spirit and Sangria – both which were delicious. The Cucumber Mint Green Tea is amazing. I tried it both hot and cold, and it’s great each way. The first thing I thought when I took a sip was how juicy it tasted. I’ve never really used the word juicy for a tea – but this one definitely was! It also made a great cocktail – the Green Spirit was an extremely refreshing summer drink that I can’t wait to keep making again and again. This is definitely a guest impressing beverage. The Fruit Sangria Herbal Tea was a little bit on the tart side, but added super flavours to the Sangria Cocktail I put together. I only had unsweetened cranberry juice on hand, so my cocktail was a little too tart – but with some sweetened cranberry juice this cocktail is golden. 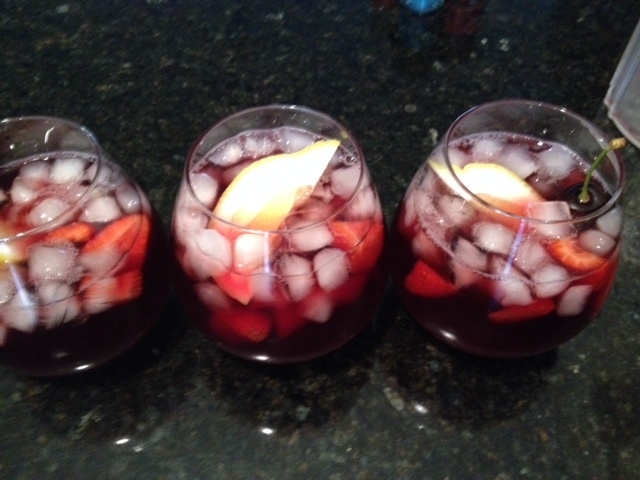 The herbal tea in the Sangria adds a lot of depth to the cocktail. I also iced the Pink Lemonade Herbal Tea. This one was also quite tart (which I actually really enjoy), and perfect in a cold form. Some sweetener would definitely make this a much better alternative to the extreme sugary lemonades you can buy in stores. More to come as I keep experimenting with some cocktail recipes! Last weekend (Jan 31 – Feb 1, 2015) marked the 3rd anniversary of the Toronto Tea Festival, and of course my third visit. Overall, the festival was great! I go every year with my dad – a fellow tea nerd. This year we decided to get there super early to avoid the lines and crowds that are growing with the popularity of the festival. When we got there right at the opening, there was already a line to get in and a crowd inside. When we left in the afternoon it was mobbed, so despite the morning crowd it was still better than the afternoon. Crowds of tea lovers are much nicer than other types of crowds so it wasn’t too bad, but it still may be nice to see a larger venue in the future. At Lemon Lily I picked up some Cafe Caramel Pu-erh. Love it! A great blend with that added kick from espresso beans. Lemon Lily offers extremely reasonable prices and some delicious flavours. I also stopped by the Riston booth and picked up some of their famed Milk Oolong. Riston is a wholesaler company, but always comes to the Tea Festival and sells out of their delicious Milk Oolong. This is one of my favourite types of teas, and Riston definitely does it justice. At Momo Tea I purchased some yummy Hojicha – a roasted green tea. 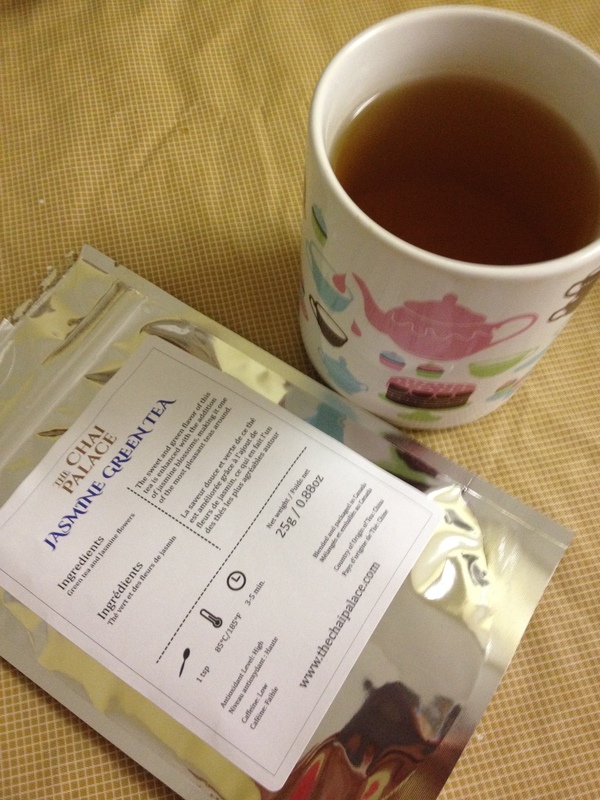 Once upon a time I had a creme Hojicha that I loved, so I was happy to pick up a new Hojicha tea. Momo, who is behind Momo Tea, was great to talk to at the festival! I of course stopped by Basilur – I’ve been enjoying their inexpensive tea for a few years now. Their tea is delicious and wonderful, with extremely reasonable prices. 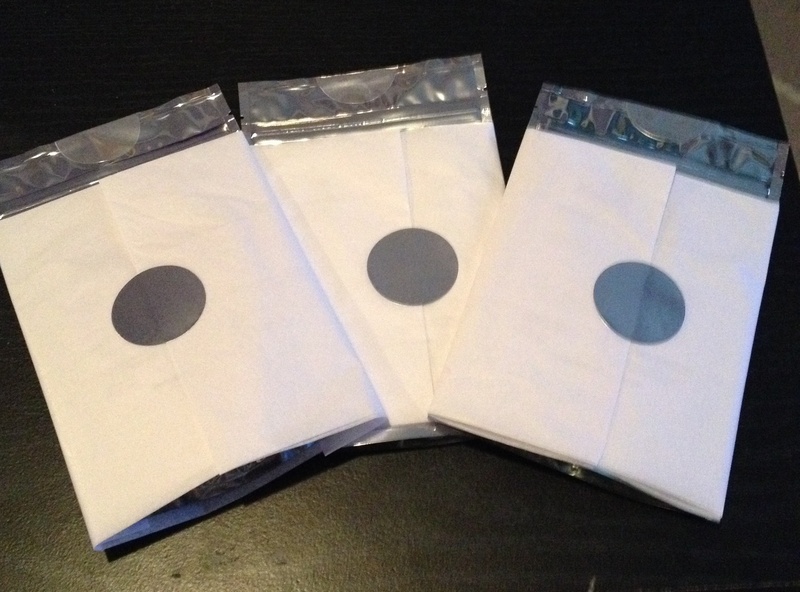 Depending on the flavour, you can get a box of 100 g of loose leaf for as low as $3! My favourite has always been the winter cranberry flavour, but this time I went for Tea Book Volume 1 – a black tea flavoured with jasmine and almond. The Peru booth was also great. Having visited Peru last year, I was stoked to see Peru represented. I picked up a new smoothie recipe too – almond milk, cooked quinoa, cacao and vanilla. So good! It’s so cool and such a great idea! I’m looking forward to seeing some of these teaBOTs throughout Toronto. 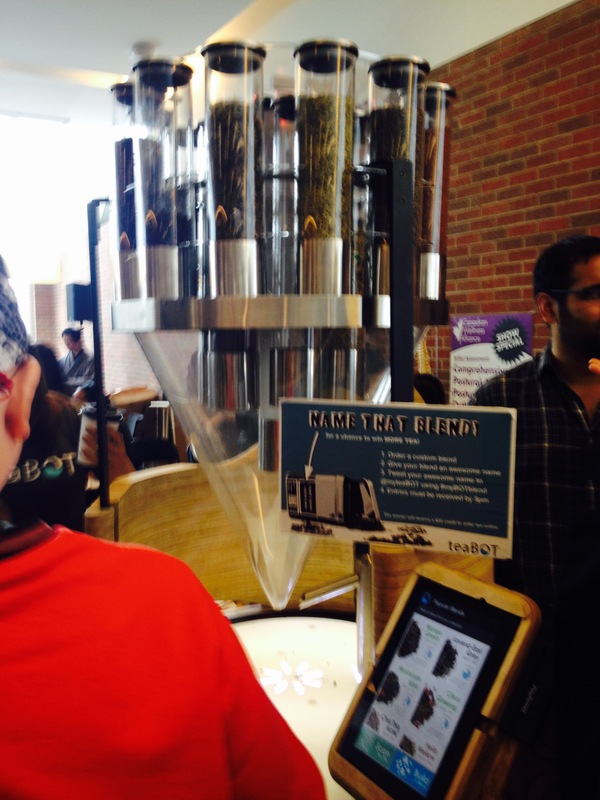 TeaBOT was giving visitors a chance to make their own blends and take some home in loose leaf format. When it launches, teaBOT users will be able to pick flavours and have a cup to go. And, one of the coolest parts – you can plan the blend out on the app and scan it when you arrive at the teaBOT. 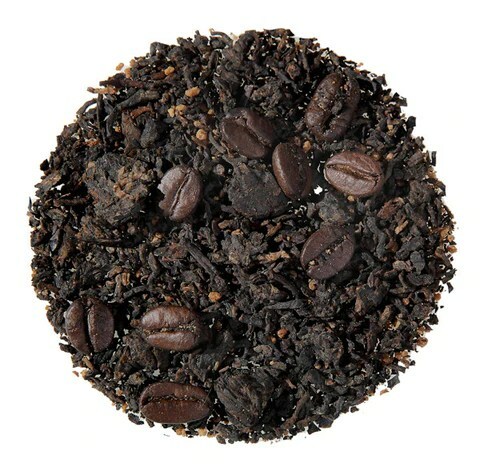 My flavour I of course named after my blog – Steeped in Tea, it was a combination of Chocolate Mate (40%), Strawberry Hibiscus (10%) and Nutty Caramel (50%). So good! Bare English & Co., where I usually stop by to pick up some tea infused lip balm, was previewing their new hand and body butter. The all natural Passion Fruit cream is great! Looking forward to seeing the rest of the line when it comes to stores, and especially looking forward to the unscented cream that will be offered. For now, check out the varieties of lip balm flavours on their website. Last, but not least, I also discovered what Kombucha is at the festival. I’m not sure why it took me so long to discover Kombucha – a fermented tea beverage. It’s fermented using a “SCOBY” – a symbiotic colony of bacteria and yeast. Pekoe Kombucha Bar was at the festival sampling their Kombucha, and it’s amazing! Dan Johanis’ talk at the festival was great, and has inspired me to start my own home brewing of Kombucha – stay tuned for more posts about this soon! These are just a few mentions, there were a lot of other fantastic tea vendors at the festival. 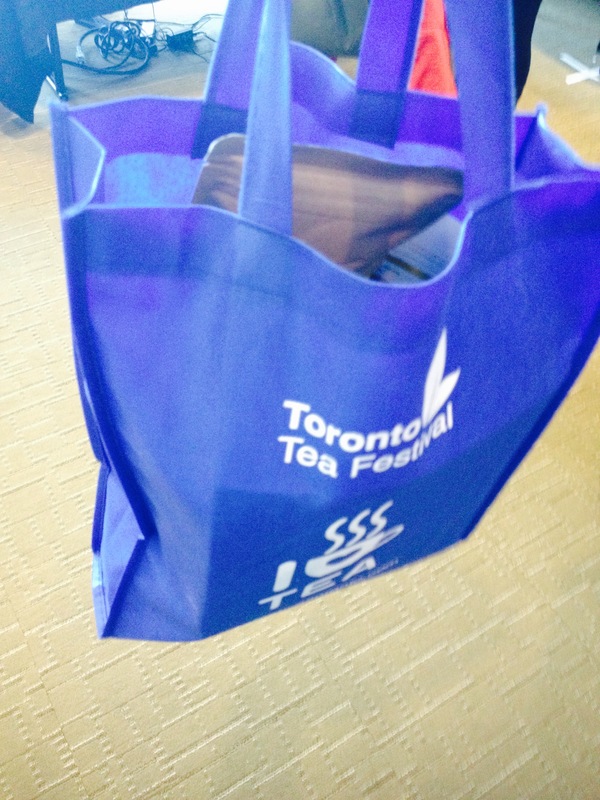 A great third year at the Toronto Tea Festival – and now a lot of work to do. And by work I mean tea to finish off!! And some home brewing to start too! My overflowing Tea Festival bag!